Legal workshop in which attorneys will help draft and sign Power of Attorney, Simple Will, Advanced Directive and a Transfer on Death Instrument for homeowners. This event will be presented by the Center for Disability and Elder Law. Assistance with executing the documents will also be provided pro bono by attorneys from the Chicagoland area. This session will also help explain and provide information on what these documents are. This is a Pro-Bono event. Veterans will need to bring a photo ID and the name, address and phone number of the person they wish to name as their Power of Attorney. 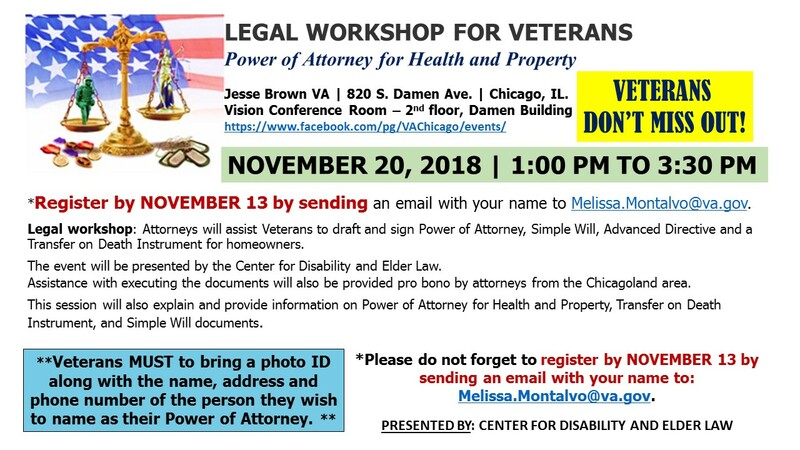 We are asking that any Veteran who are interested sign up by NOON on Tuesday November 13th as this will determine how many attorneys will be needed. Please email: Melissa.Montalvo@va.gov with your name and phone number if interested in attending the event. Jesse Brown VA Vision Conference Room – 2nd floor, Damen Building 1pm-3:30pm.